label Time = "Reaction Time (Hours)"
Temp = "Temperature (Degrees Centigrade)"
Output 81.1.1 displays the coding coefficients for the transformation of the independent variables to lie between –1 and 1 and some simple statistics for the response variable. Output 81.1.2 shows that the lack of fit for the model is highly significant. Since the quadratic model does not fit the data very well, firm statements about the underlying process should not be based only on the current analysis. Note from the analysis of variance for the model that the test for the time factor is not significant. If further experimentation is undertaken, it might be best to fix Time at a moderate to high value and to concentrate on the effect of temperature. In the actual experiment discussed here, extra runs were made that confirmed the results of the following analysis. The canonical analysis (Output 81.1.3) indicates that the predicted response surface is shaped like a saddle. The eigenvalue of 2.5 shows that the valley orientation of the saddle is less curved than the hill orientation, with an eigenvalue of –9.99. The coefficients of the associated eigenvectors show that the valley is more aligned with Time and the hill with Temp. Because the canonical analysis resulted in a saddle point, the estimated surface does not have a unique optimum. Stationary point is a saddle point. 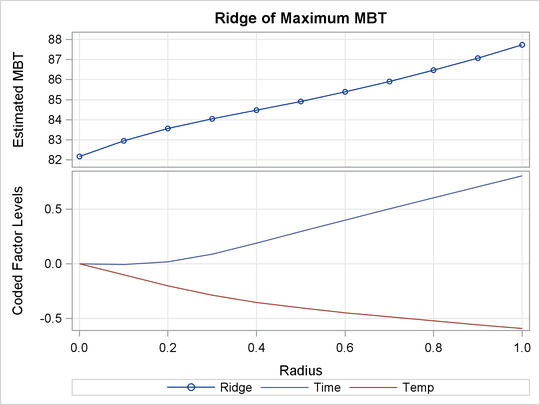 However, the ridge analysis in Output 81.1.4 and the ridge plot in Output 81.1.5 indicate that maximum yields result from relatively high reaction times and low temperatures. 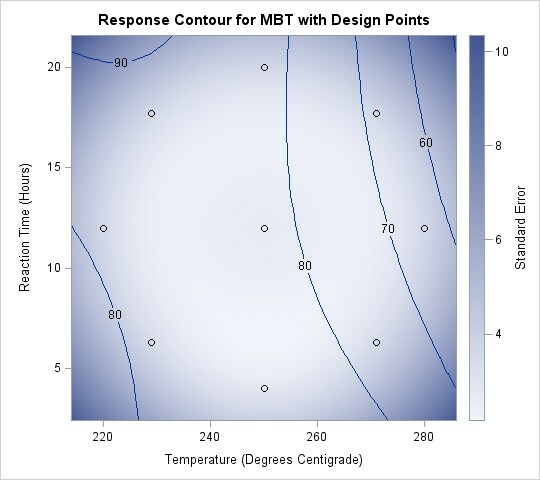 A contour plot of the predicted response surface, shown in Output 81.1.6, confirms this conclusion.